Did you know that ancient dental implants date back to around 600 AD? Archaeologists found pieces of shell that resembled teeth hammered into the jaw of a Mayan woman. And while the premise is essentially the same today, the surgical techniques as well as the components of dental implants have improved substantially—to say the least. Read on to learn more about how dental implants are constructed and placed from your dentist in Mount Pleasant. Dental implants are made of three components. The first is the actual implant, which is a small screw-like post that is surgically embedded in your jawbone beneath the open socket of a missing tooth. The post is made of titanium, which a biocompatible metal. Titanium is routinely used in a number of other medical applications such as hip or knee joint replacement. As your gums heal over the course of a few months, the implant and surrounding bone fuse together in a process called osseointegration. Once integrated, the implant replaces your missing tooth root, providing a stable anchor for your new tooth as well as the stimulation your jaw needs to generate healthy new bone tissue growth. 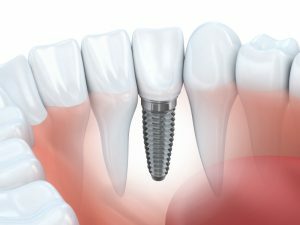 The center portion of a dental implant is called the abutment, which serves as the connection between your implant and the eventual tooth restoration. An abutment is attached to the secured implant and is visible through your gum tissue. The third component is the part that you and everyone else sees when you smile; the tooth restoration can be a porcelain crown for a single missing tooth or a partial or full implant-retained denture if you have several missing teeth. For a single tooth, an implant crown in Mount Pleasant is custom-crafted in a dental lab based on dental impressions and careful measurements. Once the crown is attached to the abutment of your dental implant, you will not be able to tell the difference between your false tooth and a real one. Dental implants can also be used to secure partials and implant-retained dentures. In this case, you may need more than one dental implant to hold your new restoration firmly in place. If you would to learn more about dental implants, or if you have a question, contact your dentist in Mount Pleasant. Dr. Robert C. Sikes is a trusted provider of general dentistry for Mount Pleasant friends and families of all ages. To learn more about his services or to schedule an appointment for yourself or a loved one, you are invited to contact the office at 903-884-0592.